Corned beef, cabbage, and green beer are as common to St. Patrick's Day as pork, black-eyed peas and cabbage are to New Year's Day. Unfortunately, the beef portion of the meal poses a problem if you are a traditional Irish Catholic and the feast day of your beloved saint falls on a Friday during Lent. This St. Patrick's Day, the Diocese of Lafayette says Bishop Douglas Deshotel, along with dozens of other bishops across the United States, has granted a dispensation, or exception, to the Lenten rule that Catholics, over the age of 14, not eat meat on Fridays between Ash Wednesday and Easter Sunday. As the decree below states, anyone who chooses to "make use of the dispensation" should also choose another act of sacrifice or charity. According to the Catholic News Service, several bishops who are making the allowance are asking their congregations to perform an act of charity or some other penitential act, like not eating meat the following day. A diocesan bishop, whenever he judges that it contributes to their spiritual good, is able to dispense the faithful from universal and particular disciplinary laws issued for his territory or his subjects by the supreme authority of the Church. 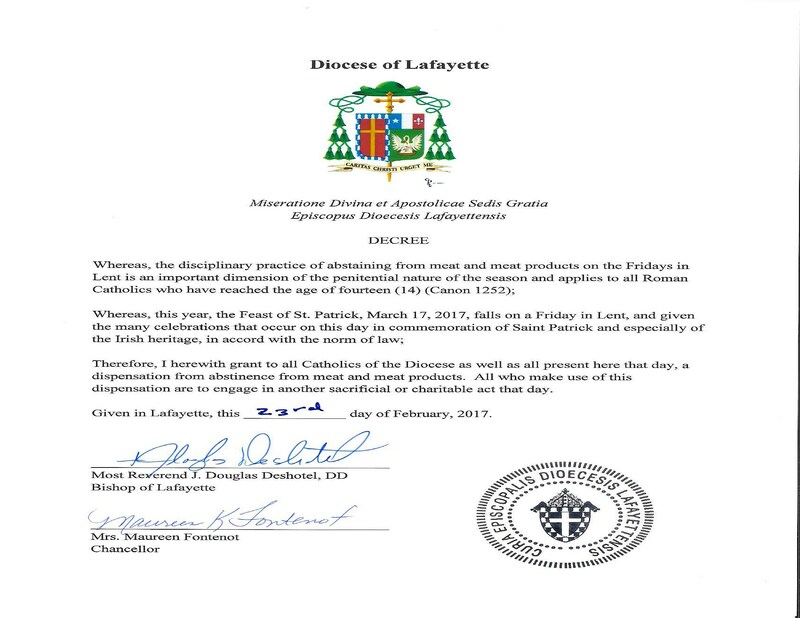 It's important to note that the dispensation granted by Bishop Deshotel is for Catholic members of the Diocese of Lafayette. Not all bishops have agreed to the exceptions for their areas, and some have given specific instructions in terms of an "exchange." For instance, Bishop Joseph Strickland of Tyler, Texas, specifically states in his rescript that those who "make use" of the dispensation should not eat meat on either Thursday or Saturday. Reading the comments in articles from bishops around the country, they all remind the Catholic faithful to remember that, if they choose to celebrate the feast of St. Patrick and take advantage of the exception on Friday, they should keep in mind that we are still in the middle of the Lenten season of penitence.